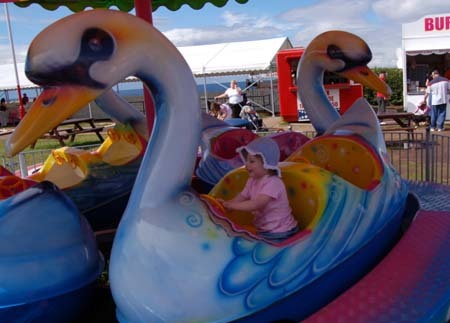 During July 2007 we visited the Haven Craig Tara caravan / holiday park in Ayr Scotland. The holiday was not what we had hoped for, partly due to the awful state of the accommodation. I’ve already written a review about the accommodation – Haven Craig Tara, Ayr Scotland – Awful Holiday Accommodation 2007 and the unsatisfactory reply from Haven and British Holidays customer services response to Haven Craig Tara, Ayr Scotland – Awful Holiday Accommodation 2007. I won’t add any more other than to say if you plan on taking a child and staying in the apartment accommodation then I seriously recommend you read those two posts first, perhaps try a caravan or a different site / company all together. With that bit out of the way here is a review of the site in general and how it shapes up for young children in particular. The site is located a short distance from Ayr in Scotland. For those travelling from England this is quite convenient as it is in southern Scotland and shorter than driving north further into Scotland. On the other hand as it is south of Glasgow it does mean that if you want to get out and see much of Scotland you have to pass through or near Glasgow which can mean traffic jams. I had been to the site before when it used to be Butlins Wonderwest World. In most ways it is no longer recognisable as the former Butlins site although some of the accommodation and other buildings still remain. One of the good things that remains from the Butlins days is the swimming pool, including flumes and a multi-level pool with slides between the levels. The disappointing thing is that there is no toddler pool, so whilst there is plenty for the older children younger children just end up in a circular pool that should have been a spa pool. This is a big disappointment as it could have made this into a good pool for the whole family. On a plus note they have the best family changing room I’ve seen. The changing area consisted of a central communal area suitable for changing young children in, with cubicles around the communal area many of which had been converted into double cubicles to make them twice the size of normal. The next thing was the soft play area. Usually a great place for toddlers to spend an hour or so, but not at Craig Tara, where the soft play area was for older children only. The one place which was better was the mini funfair, which had 3 rides for smaller children as well as the bouncy castle. Unfortunately on one of the occasions we went two of those were out-of-order, but I put that down to an unfortunate coincidence. There is a beach at the site, but it is not particularly nice. Consisting of rocks and mud as much as sand. There is however a very nice beach just down the coast at Ayr. 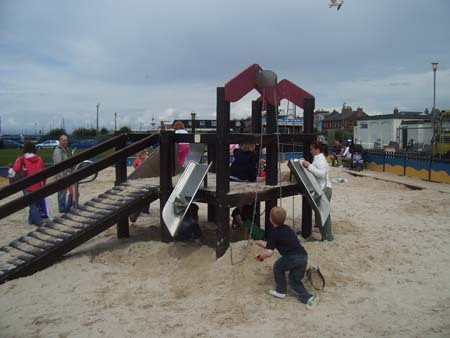 At Ayr there is also a children’s playground which is built into a giant sandpit, which is a great place to entertain children with both the opportunity to build sandcastles and play in the playground in the one place. The shop on site was quite reasonable, but the food outlets were quite poor. There was a chinese takeaway van and a Burger King, which were not particularly great. The only restaurant was that provided for the half board guests. Although it was possible to purchase a meal at the restaurant our previous experience (at Hafan y Môr, near Pwllheli in Wales), has put us off from eating at Haven half board restaurants (very pool quality food, and on one occasion there was mould on the bread roles). The entertainment was good, but you had to be into the entertainment building very early if you want a decent seat. Unfortunately the site also proved popular with those that enjoy playing load music late at night. We had some very noisy neighbours. Fortunately they were only there on a weekend break, and left after we had been there for two nights. Thankfully leaving us with quieter neighbours. In summary the worst aspect of the site was definitely the accommodation which was far below standard. Other than that the site was pretty reasonable, although certainly geared more towards older children than for toddlers. It’s not a site I’ll be rushing back to, as I think there are some better ones elsewhere in Scotland. This entry was posted on Wednesday, August 29th, 2007 and is filed under Babies, Children, Holiday, Tourism. You can follow any responses to this entry through the RSS 2.0 feed. Both comments and pings are currently closed.